Governor Andrew M. Cuomo today announced a $1.8 billion project to transform the South Bronx by realizing the long-sought reconstruction of the Bruckner-Sheridan Interchange. The Sheridan Expressway will be de-designated as an interstate and replaced with a boulevard design that is both pedestrian and cyclist friendly. The improvements to the Sheridan will tie neighborhoods together and give residents and visitors alike a direct connection to the Bronx River waterfront and Starlight Park which have been shut off to the community by the highway for decades. The project will also provide direct access to the Hunts Point Market, one of the largest food distribution centers in the world, from both the Bruckner Expressway and the new Sheridan Boulevard. More than 78,000 vehicles travel to the Hunts Point Peninsula daily, including 13,000 trucks using local roads, which has increased and contributed to poor air quality in the community. These new measures will take traffic off local roadways, significantly reducing both noise and air pollution in a borough with some of the highest asthma rates in the country. The transformational project is expected to create 4,250 new jobs. The $1.8 billion project will be completed in multiple phases, the first of which will be funded by $700 million in this year's budget. 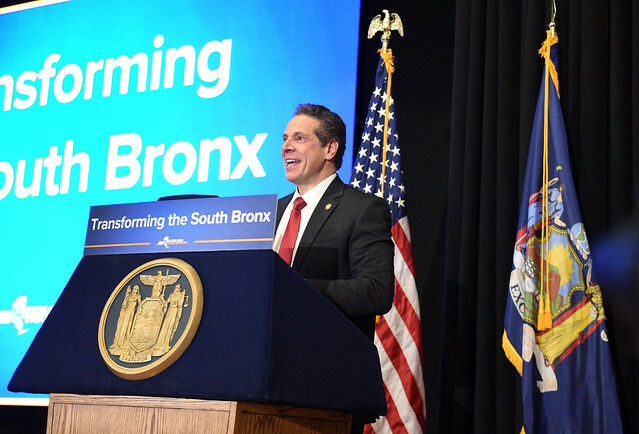 "While plans have been proposed and languished for decades, we're taking action to finally right the wrongs of the past by reconnecting South Bronx communities that have dealt with unnecessary barriers to revitalization and growth," Governor Cuomo said. "The project will create an interconnected South Bronx with access to the Waterfront, recreation, and less traffic on local streets while simultaneously better supporting those who use the Hunts Point Market – a vital economic engine for the borough." The Sheridan Expressway is a functionally obsolete part of interstate system that cuts through the heart of the South Bronx forcing residents to travel long distances to reach the Bronx waterfront and parks. The New York State Department of Transportation will seek the de-designation of the Sheridan Expressway as an interstate and instead replace it with a boulevard design that will integrate and bring together the Crotona Park, West Farms, Bronx River, and Soundview neighborhoods. The boulevard will include a number of pedestrian and cyclist friendly features including at grade crossings with direct access to Starlight Park and the Bronx River Waterfront Greenway. The boulevard will have wide medians, landscaping, and decorative lighting. A new pedestrian bridge over the Bronx River will connect Starlight Park to the multi-use path across the river. "The project will create an interconnected South Bronx with access to the Waterfront, recreation, and less traffic on local streets...better supporting those who use the Hunts Point Market – a vital economic engine for the borough." The Hunts Point Market is a vital economic engine for the Bronx, currently generating more than $2 billion in annual economic activity. As one of the largest wholesale food markets in the world, the Hunts Point peninsula also attracts tens of thousands of vehicles per day who use local streets, particularly Westchester Avenue and Bruckner Boulevard, to go to and from the interstate highway network. 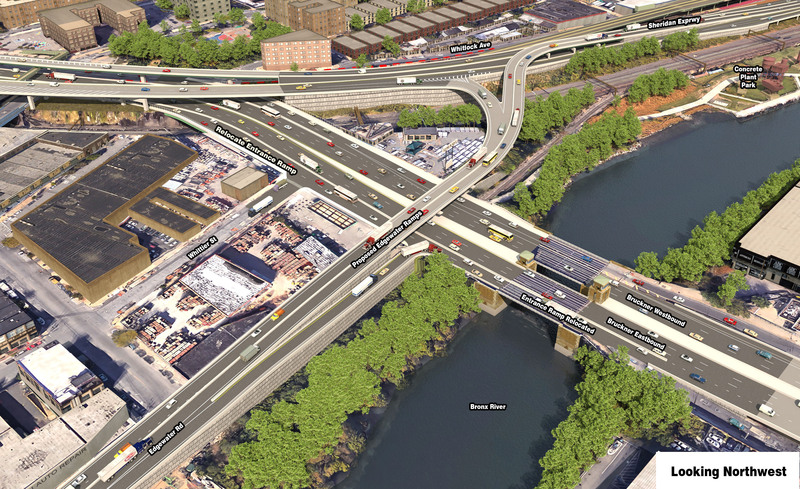 This project will transform the local roadway system by creating a flyover ramp from the new Sheridan Boulevard and a new eastbound exit from the Bruckner Expressway to Edgewater Road – which feeds directly into the market. The Sheridan ramp will remove heavy traffic and idling trucks from local roads and is expected to save five minutes in travel time for each truck that currently travels 2.7 miles on local streets. For westbound traffic on the Bruckner there will be new entrance and exit ramps at Leggett Avenue for more direct access to the market. The project will also eliminate the bottleneck at the Bruckner/Sheridan interchange by adding a third lane to the Bruckner in both directions and by relocating the Sheridan ramps from left hand to right hand entrances. The project will also implement new measures such as signing and pavement markings to direct auto, truck and pedestrian traffic within the Hunts Point Peninsula. Work to create the new Sheridan Boulevard will begin next year and that aspect of the project is scheduled to be completed by Spring 2019. The State Department of Transportation plans to accelerate the Environmental Impact Study process and use design-build contracting to accelerate completion of the full project. "The Bruckner-Sheridan improvements are yet another example of how Governor Cuomo is enhancing communities while ensuring that regions continue to grow and prosper," said New York State Department of Transportation Commissioner Matthew J. Driscoll. "This initiative will ensure that residents and visitors alike have an opportunity to enjoy the natural beauty of the Bronx like never before." This long-awaited project builds on the Bronx's transformational progress under Governor Cuomo. Earlier this year, the Governor announced the state is investing $15 million in the construction of a new $20 million Greenmarket Regional Food Hub in the Bronx to increase New Yorkers’ access to fresh, locally grown and produced food. The Governor has also invested an additional $30 million in funding for the successful Urban Youth Jobs Program, an innovative tax credit program which connects minority and at-risk youth with employment opportunities in communities across the state. The state also awarded a $1.6 million performance-based grant to open Silvercup Studio North, a new film and production studio in the borough. The Bronx will also see the construction of four new Metro-North stations at Hunts Point, Parkchester, Morris Park, and Co-op City, opening up the community to tourism and providing direct access to Penn Station for local residents. Additionally, the Empire State Poverty Reduction will bring together state and local government, nonprofit and community groups to design and implement coordinated solutions to address poverty in Bronx communities. "The Sheridan Expressway is a critical artery for the Bronx and this plan will transform it into a safer, more business friendly route that will better connect the Bronx community,” said Bronx Borough President Ruben Diaz Jr. “By enhancing access to the Hunts Point market, the Bronx River waterfront and Starlight Park, Governor Cuomo's plan will build on the success of strategic initiatives that have already made dramatic improvements to the region, and create new economic opportunities for all in our community." "For too long, Bronx residents have had to face the destructive consequences of decisions that ignored the needs of our communities, including the poorly planned Sheridan Expressway," said State Senator Jeff Klein. "Today, New York State is listening. By transforming this roadway and providing residents new access to critical park space, this $1.8 billion project will help address a past injustice and build a better future for Bronxites. With the support of Governor Andrew M. Cuomo, we are transforming the Bronx and improving the lives of thousands of New Yorkers." "I am delighted to learn about the details and the timeline that have been set by Governor Andrew Cuomo to include the Sheridan Expressway into a highway to boulevard project,” said State Senator Ruben Diaz Sr. “These improvements will help ease congestion for Bronx businesses, especially those that use Hunts Point, and they will also provide new commercial opportunities for our community. I am especially encouraged to know that these improvements will help to connect out neighborhoods, and provide better access for our families to our parks and schools. This is a project that is long overdue, and I appreciate and thank the Governor for assigning 1.8 billion dollars to get it done." "After decades of ideas and proposals to address the ill effects of this highway system on our community, I am delighted that Governor Cuomo brings solutions," said Assemblyman Marcos Crespo. "The South Bronx is becoming a thriving community of economic excitement and activity thanks to the unyielding commitment of Governor Cuomo. This project will build on that momentum, improving our transportation infrastructure and increasing access to open spaces to ensure the continued transformation of The Bronx into a buoyant, flourishing economic hub. Thank you Governor Cuomo for this major investment to which will ensure The Bronx continues to grow and thrive for generations to come." "The South Bronx has had to wage uphill battles over the years for survival to get its fair share of services and not be victimized by planning decisions that have damning consequences to its neighborhoods and people," said Robert Abrams, former Bronx Borough President and Attorney General. "Governor Cuomo's support for decommissioning the Sheridan Expressway deserves praise and provides hope and promise for redemption for a number of communities. The open space and water access will provide important recreation areas for a deserving population." "The Governor's $1.8 billion plan to transform the South Bronx will reconnect these neighborhoods and allow our communities to thrive and grow for generations to come," said Fernando Ferrer, former Bronx Borough President. "I am thrilled to see the future of the Sheridan Boulevard come to fruition through this bold plan. New York has made great strides in improving the lives of residents across the Empire State and I thank the Governor for making this historic investment to ensure our communities continue on this upward trajectory and remain sustainable for decades to come."